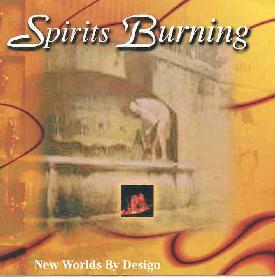 Spirits Burning - "New Worlds By Design"
The brainchild of Don "Spaceship Eyes" Falcone, Spirits Burning began life in 1986 as a band and has cropped up in recent years on a few Cleopatra tribute CD's and in concert. In 1998 Don sent out invitations to numerous spacerock musicians to join in a group project that in most cases involved Don sending out tapes that the various participants added to. And looking at the lineups on each track it's clear that many of these tapes traveled between more than two points. The result has got to be one of the most ambitious projects of 1999. It is, as Don describes it, "A Gathering in Space". "By Design", "Arcturus", and "Snakebite Serum" are the heavy spacerockers represented on the set. "By Design" is a potent space power rocker with crunchy guitar from Joe Diehl pumped up by the keyboard combo of Don on organ and Paul Williams (quarkspace) on Prophecy. "Arcturus" is a heavy spacerocker from Len Del Rio and Tommy Grenas (both of Pressurehed, Farflung, Anubian Lights, and more). And "Snakebite Serum" is a fast-paced rocker with blazing guitar from K. Soren Bengtsson (DarXtar), along with saxes, tablas, and a heavy keyboard backbone. There are also numerous soundscape atmospheric pieces on this CD, though they are far from being simple floating electronica. In nearly every case the music has numerous layers of synths and spacey guitars which add a bit of complexity to the dreamy environment. "Beautiful Stealth In A Church" includes several contributors that create an aural collage of sound using mostly synths, but also Daevid Allen on gliss guitar and Knut Gerwers reciting a freeform style of poetry. "The Ticking Of Science" is partly a Tangerine Dreamy soundscape work, but includes drum 'n bass beats and loads of bleeping freaky synth sounds. At 13 minutes it gets to stretch out a bit and continually changes direction and rhythms. "Smart Messages In The Sand" is another track that grabbed me with its techno beat, many layers of synths, and gorgeous soaring guitar. The disc also includes a few song-oriented tracks. "Secret Invention" is an electro-pop tune that is as complex as it is simplistically toe-tapping. "Speak To The Wind" has a New Wave rockin' feel with a thudding bassline and loads of freaky space sounds. And "The Unknown" is a heavy rocker with dual smoking guitars and Karen Anderson on vocals. Finally, "Arc - A Real Creeper", is an atmospheric piece with gliss guitar and poetry from Daevid. Don had told me earlier about how Daevid Allen was at his home and found his college thesis of poetry on the shelf and just started reciting from it. The result is a freaky but floating tune that serves as a fitting close to this fine collection. In summary, there is something for all spacerockers on this collection. A true spacerock supergroup effort that combines a variety of talents. For more information you can visit Don Falcone and Spirits Burning at their web site.